Canandaigua, N.Y. -- What attraction in the Finger Lakes region or New York State for that matter, offers a day for guests to sample the attraction free of charge? Roseland Wake Park is doing just that on Saturday, June 17th from 10 am-5 pm with its Roseland Wake Park/Liquid Force Free for All event. “Even if you’ve never been on a wakeboard this event is not to be missed. We are offering free admission to the cable park, rentals and lessons. The free 15 minute wakeboarding lessons at the Lil Bro Learn to Ride Center will be available on a first come, first serve basis”, states Roseland Wake Park Manager, Kyle Dickman. 2016 Pro Wakeboarding Champion and Liquid Force team member, Harley Clifford will be putting on demo cable sessions at 12 pm, 2 pm and 4 pm. There will be free 15 minute wakeboard lessons at the Lil Bro Learn to Ride Center, every 15 minutes starting at 10am and running through 5pm (first come basis), free open riding on the main cable from 10am-4pm and free wake skating on the main cable from 4pm-5pm. DJ Lil Spoon will mixing tracks throughout the day. The pro shop will offer 10% on all merchandise on June 17th only. Event Sponsor Liquid Force will be on hand to give away hats and other promotional items. Liquid Force is the U.S. based manufacturer which produces a line of wakeboards, wakeskates, wake kites, wake surf boards and apparel. 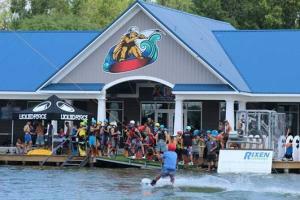 All rental equipment and retail boards at Roseland Wake Park are manufactured by Liquid Force. Drew Broderick, Marketing Director, encourages families to attend this event. “This is a family friendly event and we encourage families with kids ages 5+ to come out and take the free lesson at the Lil Bro Lean to Ride Center on Saturday. The Free for All is also a very fun spectator event.”, states, Broderick. Doug’s Fish Fry Food Truck will be set up adjacent to this event selling a limited menu and donating the proceeds to the Bristol Freestyle Fund which raises money for six former Bristol Mountain’s Freestyle Team who are competing on the US Ski Team, the Elite Aerial Developmental Team and up and coming Bristol Mountain Freestyle Team athletes. All of these athletes aspire to compete for Team USA in future Winter Olympic Games. Bristol Mountain owners have a collaborative ownership with Roseland Wake Park.